The university serves student from diverse backgrounds and from different continents across the world in their 3 campuses. The main characteristics that set Daystar apart from other Kenyan universities is that they give their students hands on experience making the students relevant in the job market right after they graduate. In their quest to provide students with hands on skills that are relevant in the job market, the school has set up different facilities across their campuses. They have a fully stocked library with very useful material to students undertaking different courses at the institution. The lecture halls are also high tech and well equipped to give a good learning and teaching environment for all the students. Most of the lecture halls are fully equipped with the latest technological equipment used by many world class universities. The university’s main campus and all the other campuses in Nairobi and Mombasa also have fully equipped computer laboratories. Complete with access to the internet, the computers come in handy to students, especially when it comes to research. The institution also found it wise to have communication studios within the institution. Daystar is best known for media and communication studies. The studios help to equip the media and communication students with hands on experience. Daystar University campus portal was designed to improve the efficiency of the institution in service delivery. With the digital age that Kenya is moving towards, it is very important that institutions of higher learning to invest in digitizing the normal operations of the institution. It makes it easier for administrators to run daily events in the school and reduces the amount of manpower required. It is easy for students to carry out certain requirements online and avoid long queues. This gives them more time to study and concentrate on their academics. Students can login to their university student portal that can help them do a number of tasks. The home screen displays any news or notices that the students should be aware of. This makes it easy for the administration to share useful information with the students quite easily. There are useful links available and the university contact information that students may require. From the main bar in the student portal, students who are logged in can see information from the student bodies, notices, campus news, classifieds, lost and found items and some off campus information that can be useful to them. 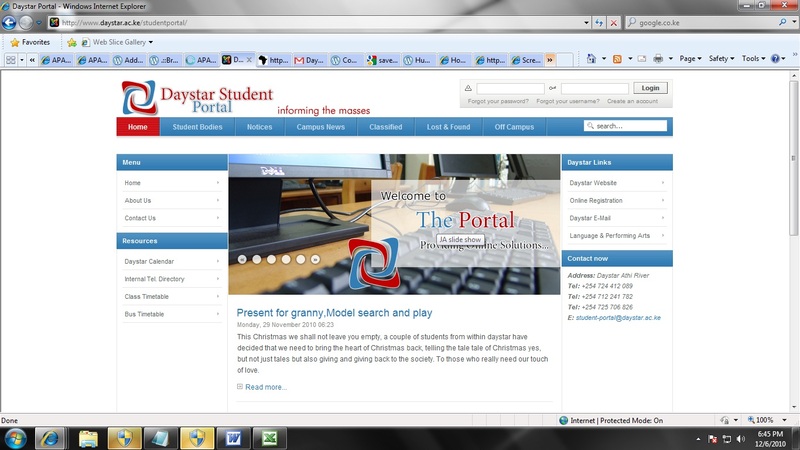 There are also other useful resources in the Daystar student portal. Students can access the university calendar. There is an internal telephone directory, the class timetable and the bus timetable. All these have invaluable information that students require at all times. The faculty portal has very useful information to members of a particular faculty. Members of the faculty have access to this portal and they can receive news relevant to the faculty and other upcoming events. If you are applying for a course at Daystar University, you do not have to physically avail yourself at the institution. Applicants can make their applications easily online through the Daystar applicant portal. Through an easy process, you can create your account on the portal and go about submitting your application online. You can easily login later through the credential you used to check the status of your application on the portal. The Daystar University campus portal is a great initiative and has made administration and running of the institution very easy. This entry was posted in Business, ICT. Bookmark the permalink.